As a NIMBioS postdoctoral fellow, Dwueng-Chwuan "Tony" Jhwueng (Ph.D. Mathematics, Indiana University, 2010) designed new phylogenetic comparative methods for comparative analysis under non-tree-like evolution. Upon completing his fellowship at NIMBioS, Dr. Jhwueng accepted a position as assistant professor of statistics at Feng-Chia University in Taichung, Taiwan. Jhwueng DC. 2013. Assessing the Goodness of Fit of phylogenetic comparative methods: A meta-analysis and simulation study. PLoS ONE, 8(6): e67001. [Online]. Beaulieu JM, Jhwueng DC, Boettiger C, O'Meara BC. 2012. Modeling stabilizing selection: Expanding the Ornstein-Uhlenbeck model of adaptive evolution. Evolution, 66(8): 2369-2383. [Online]. Gilman RT, Nuismer SL, Jhwueng DC. 2012. Coevolution in multidimensional trait space favors escape from parasites and pathogens. Nature, published online 4 March 2012. [Online]. Jhwueng DC. 29 August – 1 September 2011. Mathematical Biosciences Institute, The Ohio State University Workshop for Young Researchers in Mathematical Biology. Jhwueng DC. 29 April – 1 May 2011. Graduate Student Probability Conference 2011. Georgia Tech, Atlanta, GA.
Jhwueng DC. March 2011. Invited talk. National Kaohsiung University. Jhwueng DC. March 2011. Invited talk. National Cheng-Kung University. Jhwueng DC. March 2011. Invited talk. National Cheng-Chi University. Jhwueng DC. March 2011. Invited talk. National Taipei University. Jhwueng DC. March 2011. Invited talk. National Chung-Hsing University. Jhwueng DC. March 2011. Invited talk. National Pingtung University of Education. Jhwueng gave a talk, Modeling phylogenetic comparative methods with hybridization, at the NIMBioS Interdisciplinary Seminar, January 2011. 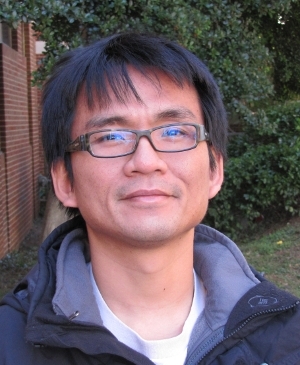 Jhwueng is a participant in the NIMBioS Working Group on Gene Tree Reconciliation and the NIMBioS Working Group on Species Delimitation. He also participated in the NIMBioS Tutorial: Migration from the Desktop: HPC Application of R and Other Codes for Biological Research and the NIMBioS Tutorial: Graph Theory and Biological Networks. Jhwueng was a math mentor for the NIMBioS Research Experiences for Undergraduates and the Research Experiences for Veterinary Students project: How does the effort a mother bird expends on her offspring depend on the attractiveness of her mate? from June 7 to July 30, 2011. Jhwueng participated in the Mathematical Biosciences Institute Workshop: New Questions in Probability Theory Arising in Biological Systems, September 2011. Jhwueng participated in the Phylogenetic Discussion Group meetings at the Univ. of Tennessee (UT) Department of Ecology and Evolutionary Biology, Fall 2011 and UT's Grant Writing Workshops, Spring 2011. Jhwueng also attend the Joint Synthesis Center Postdoctoral Symposium at the National Evolutionary Synthesis Center in April 2011.